Oklahoma Attorney General Scott Pruitt has been nominated to head the Environmental Protection Agency. Pruitt has a record of fighting EPA regulations. The EPA adopts regs for clean water and protecting threatened/endangered species–like the Kokanee salmon in Lake Sammamish. Scott Pruitt for director of the Environmental Protection Agency. Ryan Zinke for Secretary of Interior. Rick Perry for Secretary of, umm, ahh, Oops. These are President-Elect Donald Trump’s choices for environmental departments. In the case of Perry, the Department of Energy, the agency he wanted close but for which he famously forgot and said Oops in his 2012 run for president. Energy has no small impact on the environment. 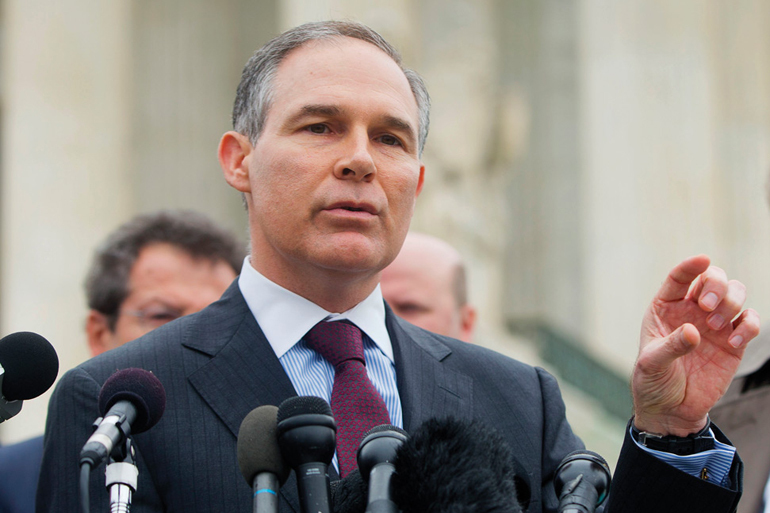 Pruitt, the attorney general of Oklahoma, fought EPA regulations for years. Zinke, a first-term Congressman from Montana, received just s 3% rating from the League of Conservation Voters. And now they will be in charge of clean water and endangered/threatened species regulations. There are direct, local implications. Perry, the former governor of Texas, is a drill, baby, drill advocate for oil. There aren’t any oil wells around Sammamish, but clean tech energy falls under the US Department of Energy. Trump and Perry are hardly friends of alternative energy, which is heavily promoted in the Seattle area. But Trump’s environmental policies, and the advocacy of Pruitt and Zinke, raise questions over environmental protection and species protection right here in River City, as the musical goes. Clean water and Kokanee salmon go hand-in-hand. Kokanee are unique to Lake Sammamish. There is a special Kokanee Working Group under the auspicies of King County to which Sammamish belongs dedicate to restoring local creeks the feed Lake Sammamish and encouraging protection for the threatened species. City Councilman Tom Odell is Sammamish’s representative on the Working Group. Wally Pereyra, who lives on Lake Sammamish Parkway, spent hundreds of thousands of dollars restoring Ebright Creek and is starting to invest in Zackuse Creek, both of which run through his property, for the benefit of the Kokanee. Pereyra also has spent hundreds of thousands of dollars in legal fees appealing upstream projects that could threaten restoration of the creeks and the Kokanee. What impact will Pruitt, who has a hostile record toward EPA regulations, and Zinke, who is likewise hostile to Interior, have on regulations affecting the Kokanee is a big question. Likewise, EPA regulations have been front-and-center in Issaquah’s drinking water problems. A chemical with the acronym PFOS has been found in its drinking water at a level 31 times EPA guidelines. Issaquah had to shut down two wells until it could lease water filtering devices. But PFOS now has been found in other wells. Trump’s choices for EPA and Interior could have direct, adverse implications for Sammamish and Issaquah if regulations are relaxed or eliminated. I see no inconsistency between the sad truth that Pruitt doesn’t believe that pollution is a problem that transcends state boundaries, and a local landowner’s myopic concern for the streams on their own private property. This is, after all, the libertarian ideal that the Kardashian President-elect espouses too. Protect your own property interests at all costs, and to hell with the impacts on your neighbors, nation and planet. Welcome to Reality TV Government by libertarians. Then again… he’s already reneged on his campaign promises to “lock her up”, “build a wall” and “drain the swamp”, so who the hell knows what he is going to actually do, other than enrich his own wealth. You broke it, you bought it, as they say in the china store. Oops… just read the news today… he’s not going to “ban muslims” anymore either. You realize he is not President yet right?